Small apartments or older homes often come equipped with absolutely no closet space—or the closet space is much too small and inadequate for your needs. While you could buy a treadmill to act as a clothes horse in your room, there are better ways to sneak in storage without feeling like you’re living in a closet. The first thing to do is pare down your wardrobe to reduce the amount of space you need to store your clothing. Donate, sell, or throw away anything that doesn’t fit or that you have not worn in a year for whatever reason. Once you’ve cleaned out the clutter, you’ll have a better idea of how to tackle the rest. Freestanding clothing racks on wheels allow you to move your closet wherever it fits best into your space. Stand a rack near a wall in a bedroom or use your hanging wardrobe as an artistic divider between open areas of your living quarters. 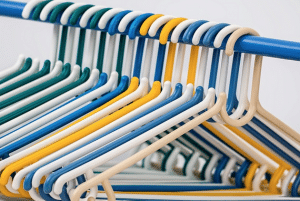 Some clothing racks come with optional slipcovers. With the slipcover closed and zipped, your hanging clothes look tidy and tucked away. Sometimes you just don’t have enough room for a bulky clothing rack, but you still need to hang your clothes. Get creative and use your walls to their full potential! Buy sturdy metal or plastic hooks from home improvement stores and screw them into the walls at intervals (be sure to use appropriate drywall screws or find wall studs in order to hold the weight of your clothing). Next, install a curtain track along the ceiling in front of the hooks, allowing enough space between the curtain and the clothing hanging on hooks for the curtain to be pulled closed easily. This solution takes up mere inches of floor space, and when a pretty curtain fabric is attached to the track and pulled across the wall, your closet becomes a lovely focal wall. You can even use this idea for multiple walls in your bedroom or other living areas. If you love the look of built-ins but don’t want the cost, freestanding wardrobes or closet systems (check out IKEA’s many options) are the perfect choice. Anchor the furniture to the wall for safety and use paint to unite it to the room and to make your new closet or wardrobe look like it has always been there. Out-of-season clothing takes up a lot of room—especially the bulky coats, sweaters, and jackets of winter. Instead of keeping it stacked around your house, rent a storage unit and swap out one season’s wardrobe for the next as needed. Storage units come in all sizes, and you can also choose climate-controlled options to keep your clothing and other stored items at a constant temperature (which prevents damage). Use vacuum seal bags to prevent insect infestations and any possible water damage as well as reduce the space you need for storage of bulky items. Value Store It offers multiple self-storage locations throughout Florida, New York, and Connecticut. With a unit for every need and budget, you can have the convenience of storing your valued possessions close at hand without having them underfoot. Visit our Home page to reserve the right storage unit for you needs.